Normally, one would only expect to see a drum corps director standing in front of a marching unit on a practice field, not conducting major concert organizations. However, this is now a noticeable trend in the country as more and more drum corps figures are becoming some of the most well known music educators/composers at the high school and collegiate levels. 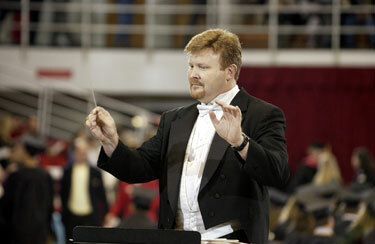 Kenneth G. Bodiford, director of Spirit and director of bands at Jacksonville State University in Alabama, was selected to conduct one of the 2006 Alabama All-State Concert Bands. The Alabama All-State Bands are comprised of some of the most talented high school band students from programs across the state. The students that are chosen go through a rigorous audition process and those with the highest scores earn positions in these very prestigious concert bands. Kenneth Bodiford, executive director of Spirit from JSU and director of bands at Jacksonville State University. More and more, people closely associated with drum and bugle corps are becoming well known in the field of music education. "There are numerous former drum corps members that are prominent forces in the world of music education today," said Bodiford. "Some of the most outstanding band literature composers of today as well as many of today's leading performing artists have a drum corps background," he added. As today's modern drum corps continue to strive for extreme musicality, they are becoming more accepted and respected as advocates in the music education movement. "It's not just about playing loud anymore," explained Bodiford. Some of the country's most respected musicians are now teaching or offering instructional clinics with most of the drum corps across the country. "I believe that drum corps are having a very positive impact on the up-and-coming young band directors of today. The young people that choose to participate in drum corps are getting outstanding instruction as well as extreme amounts of discipline through the activity. Both outstanding instruction and discipline are two of the main components needed to mold successful music educators," said Bodiford. "Many of the attributes that are taught in a summer of drum corps translate directly to the concert stage: breath support, listening for good intonation, articulations, dynamic contrast and phrasing, to only mention a few. As a college band director, it is very obvious to me when a student returns from a summer with a positive drum corps experience. The student usually has much more discipline when it comes to practicing. Their rehearsal etiquette is much improved and their attention to detail is very much enhanced." "I will never forget my drum corps experience with Suncoast Sound," said Bodiford. "I was so fortunate to have the opportunity to be under the instruction of both Frank Williams and Robert Smith, two huge names in the world of music education. They had a profound impact on my life as a musician. My drum corps experience definitely gave me the discipline that I needed as a young musician in order prepare me for a career in music education. I wouldn't trade my 1986 experience with Suncoast Sound for anything in the world."